That’s one of the reasons I am happy to see the publication of What’s Up: Discovering the Gospel, Jesus, and Who You Really Are, by Jack Klumpenhower and Deborah Harrell. They use illustrations, stories, and interactive activities to help kids understand why the gospel really is good news. What need does it meet and how might God use it to change lives?? It answers the real questions of identity and purpose that begin to unfold in middle-school hearts and minds. 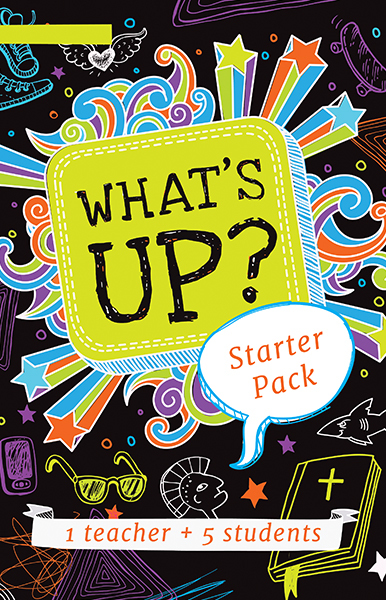 Revealing God’s love, forgiveness, and power to change, What’s Up? helps fourth through eighth-grade students understand that the gospel is all about God making us into who he meant us to be all along. As they learn how to lean wholly (and happily) on Jesus through these formative years, their lives are changed from the inside out. There are 15 lessons, each designed to take about 90 minutes. But you can go at a slower pace, expanded it to 27 weeks with 45-minute lessons..
How is the material broken down? Could I see a sample? Are there helps for teachers? There is a corresponding guide just for teachers, filled with instructions, notes, helps, and directions to make teaching the gospel to children clear and simple in the corresponding teacher guide. It requires little work outside of the classroom or teaching setting. Is this just a Sunday-School curriculum? The curriculum is flexible and can be easily adapted to a variety of settings besides Sunday School (e.g., youth group, Christian school, homeschool, family devotional supplement). Can you hook me up with a deal? If you decide to pick this up, I hope you find it helpful!